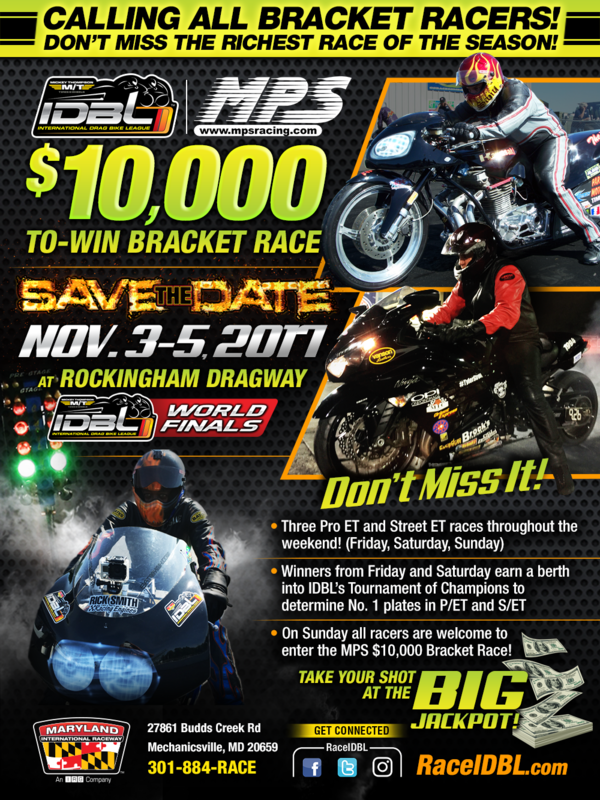 The Man Cup 2017 DME Nationals, held at Rockingham Dragway, September, 23-24 2017, was a historical event to be sure. The race was full of great side-by-side drag racing at a first class racing facility and the on track performance by the racers was just off the hook and in fact, historic. 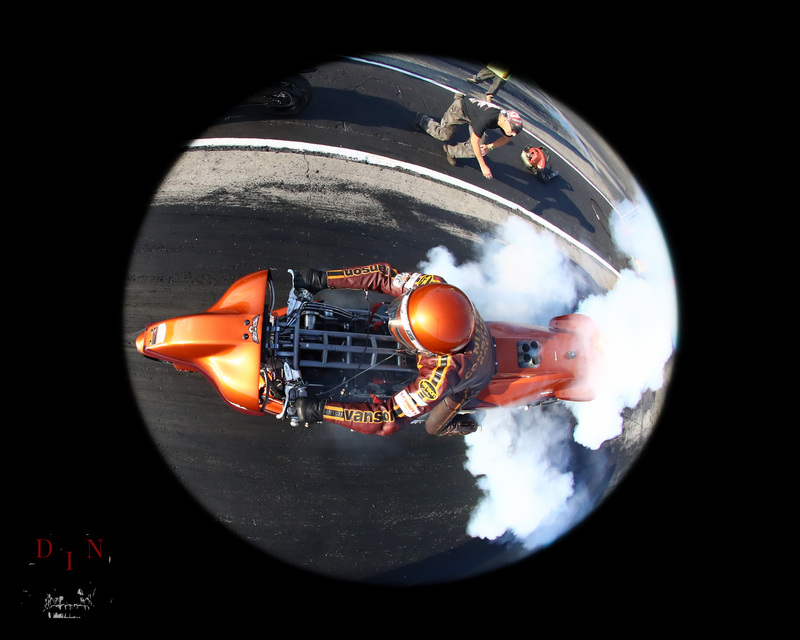 Niki Zak made history becoming the first female dragbike racer to run over 200 mph. Barry Pryer Sr. had a great time as always. 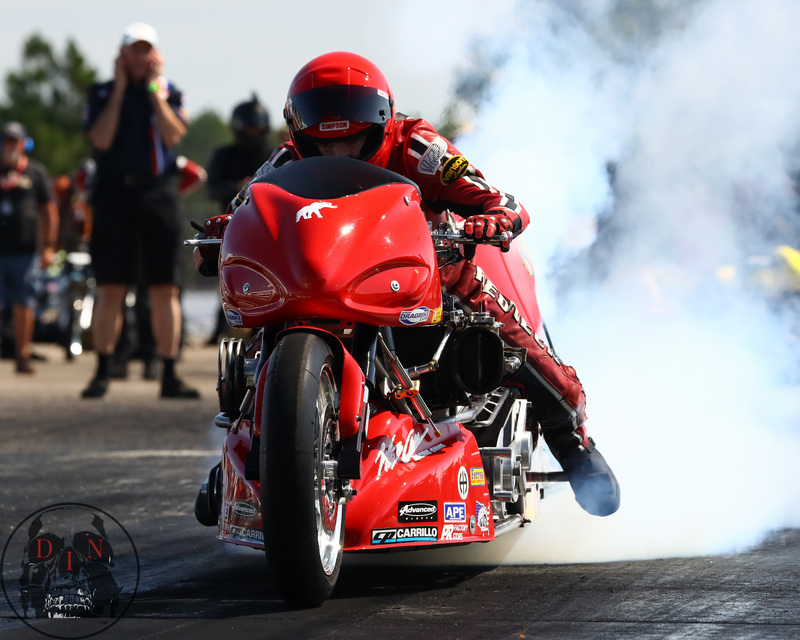 The historical part of the weekend started off during Q-1 of Nitrous Express Pro Open class qualifying. It all began with Niki Taube Zakrzewski making a 6.51 elapsed time pass down the quarter mile of Rockingham Dragway, then stopping the MPH clocks with a 200.65 miles-per-hour recorded speed. 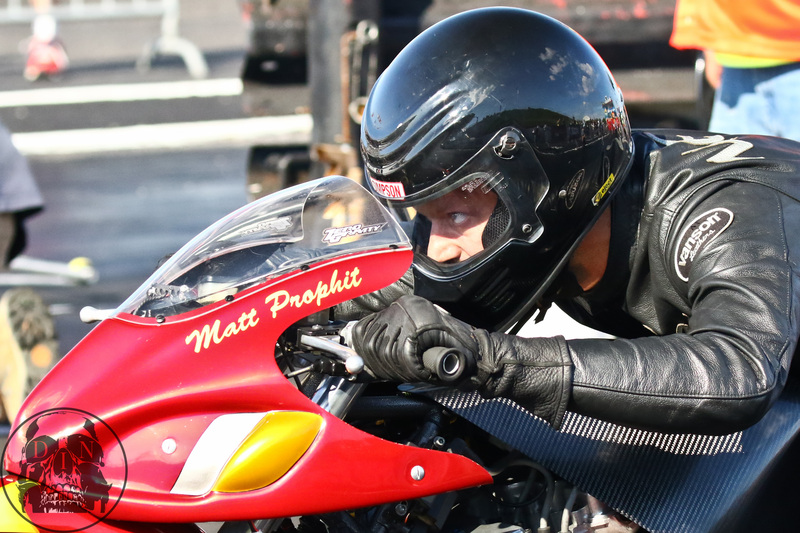 By virtue of that run, she became the first woman in motorcycle drag racing to crest the 200 MPH mark in competition. Dan Wagner created the tune up, Niki Zak set up the clutch; the bike ran flawless. She then went on to win the event in Nitrous Express Pro Open class racing over Mark Rendeluk. With fans and racers already a-buzz from Niki, Zak’s numbers, Sam Wills got everyone’s attention with a 5.90 ET @ 234MPH, which led the Pingle Top Fuel field after Q-1. 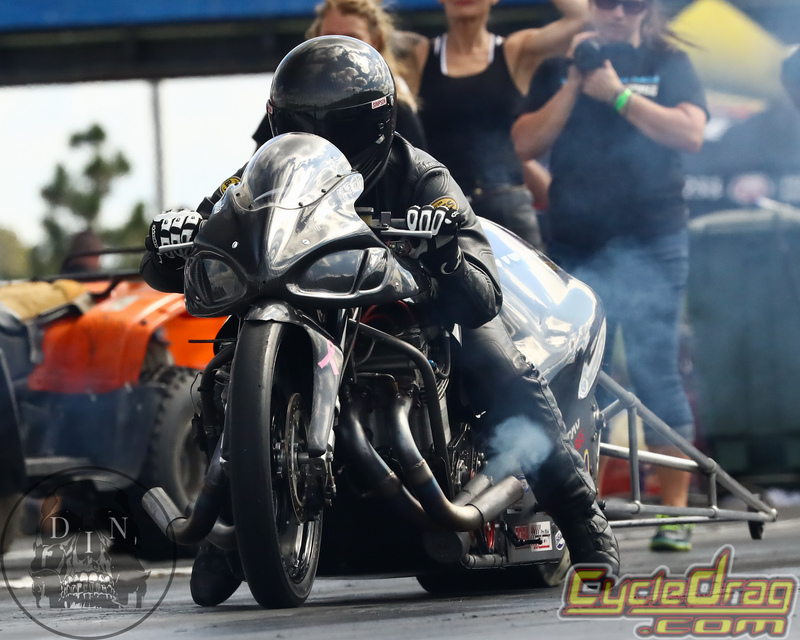 With a stout Top Fuel bike field, all of the I-4 fuel bikes were in the 6’s; this race was shaping up to be a great one. The Top Fuel racers did not disappoint. People expect records to fall at The Rock; it has a first class racing surface with a great shut-down area. But Sam’s opening round thunder was stolen by the Spiderman, who tried to rotate the Earth. McBride racing did well; qualifying #2, behind the Nitro Conspiracy team. But they were not done by a long shot with their tune-up. Team McBride came out in Beast Mode on Sunday. During E-1, Larry McBride and Chris Hand uncorked Man Cup’s first ever side-by-side 5 second elapsed times in competition. 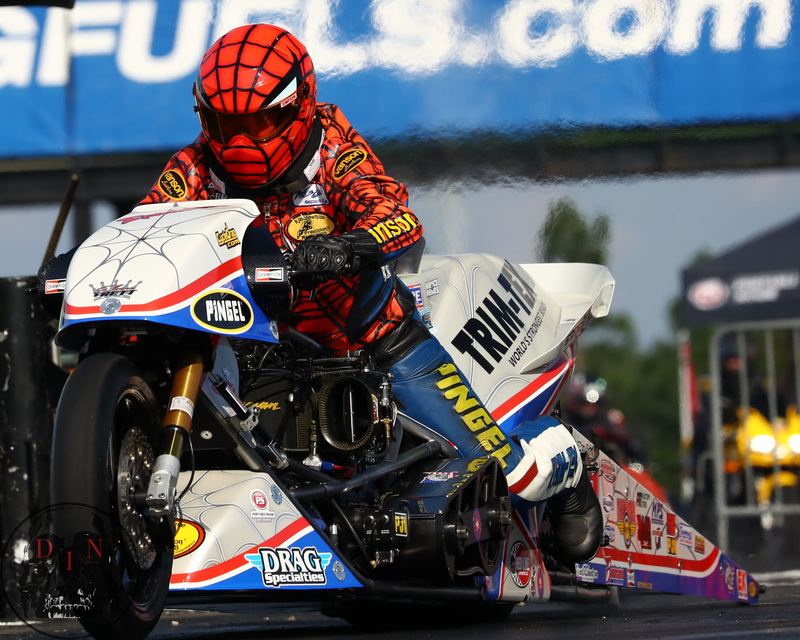 Chris Hand’s 5.88 @ 222 MPH, was a personal best for the Red Neck Express, but a thundering Spiderman drove past Chris with a 5.95 @ 248 mph, that was preceded by a hole-shot, which gave Larry McBride a .0014 MOV! Team McBride then unleashed the beast on Dave Vantine during E-2 with a run that will long be remembered in motorcycle drag racing history. 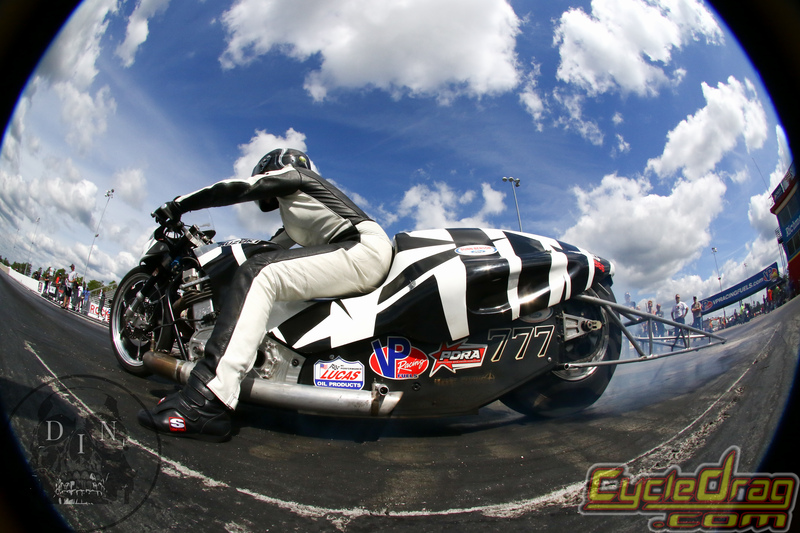 Larry McBride, on his next pass stopped the Rockingham Dragway MPH timers at a jaw-dropping 255.29 MPH! 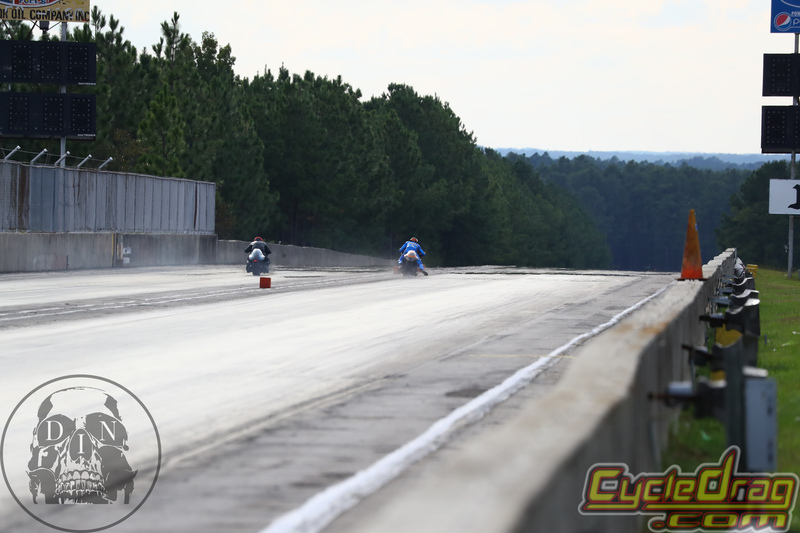 That my friend’s is the fastest pass ever recorded by a drag bike in motorcycle drag racing history. There was bedlam on the starting line by the Top Fuel motorcycle faithful. 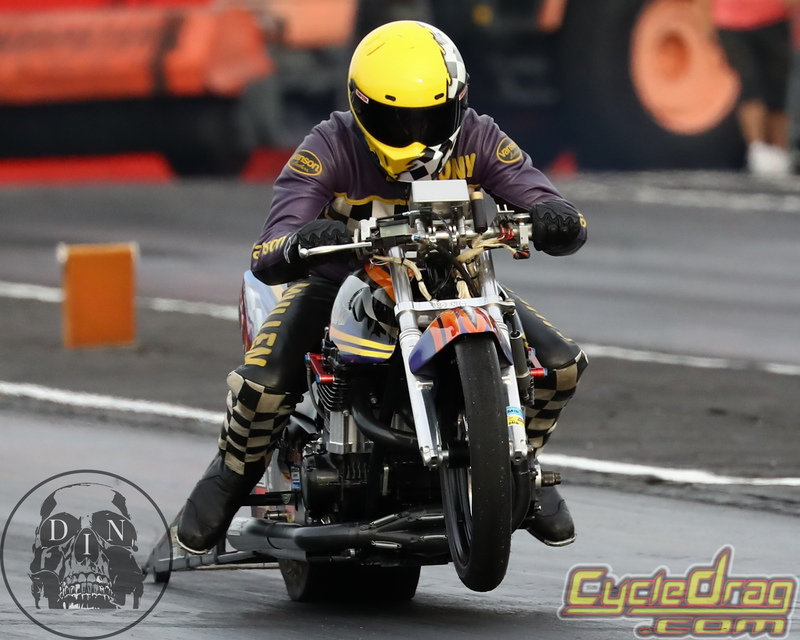 McBride then went on to defeat Sam Wills in the Pingel Top Fuel final round, to add a little padding to his Man Cup championship points total, going into the last race of the season. Sam and Larry are very close in points and either can still win the championship. 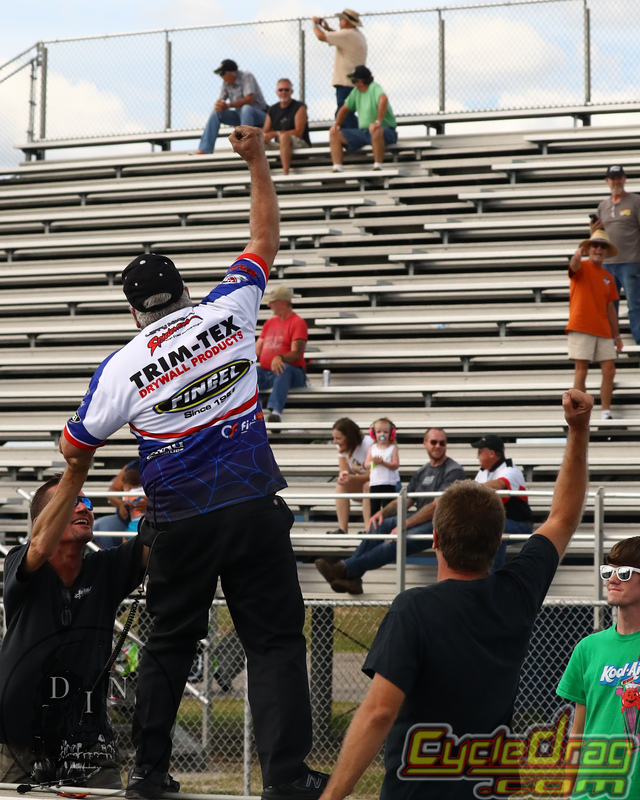 In Falicon Pro Mod racing: Ronnie Smith got everyone’s attention with a 4.04 elapsed time, right off the trailer. No one knew at the time of that run, that by the end of qualifying, the top 6 qualifiers in P/M would all be 4.0 runs, talk about a tight field for Sunday eliminations racing – wow. 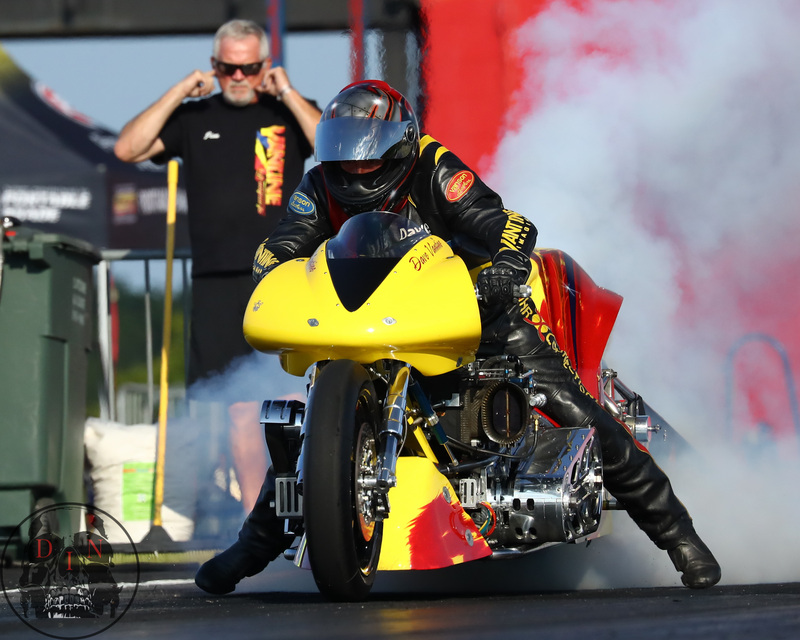 Throughout eliminations, Ronnie Smith maintained his momentum, all the way to the final round, where he defeated Travis Davis, for a commanding victory in Falicon Pro Mod. 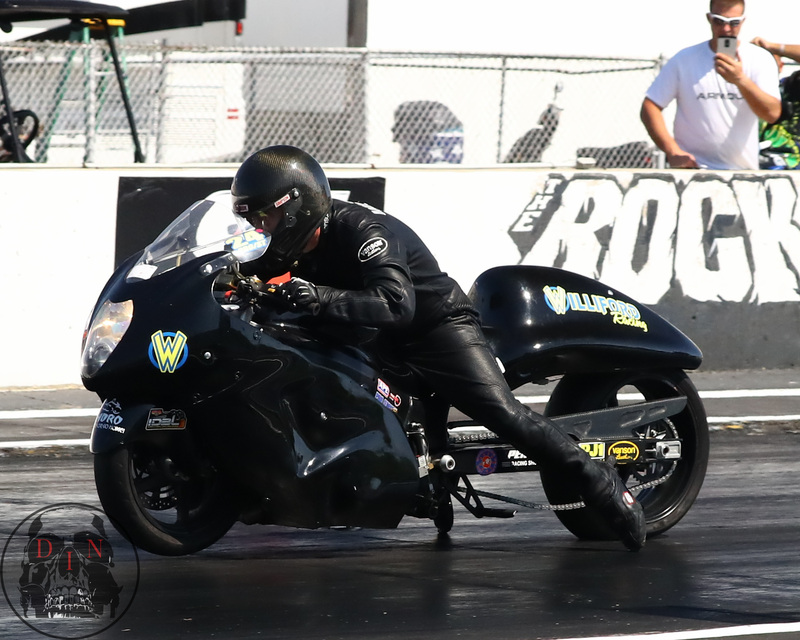 APE Pro Street racing also presented true high performance at The Rock. In qualifying, Rodney Williford delivered a 6.70 elapsed time at over 220 MPH, grabbing everyone’s attention. No one knew at the time this would not be his best run of the weekend. That would happen on his next pass during E-1 with a blistering 6.66 @ 225 MPH, which sent Rodney to the top of the Orient Express GOAT List of Greatest Of All Time runs in P/St. Unfortunately in E-2, while facing his team-mate Ehren Litten, Rodney broke traction just at the hit and aborted his pass, which vaulted his team-mate, Ehren Litten into the finals. There, Ehren defeated #2 qualifier Terence Angela, to take the win in APE Pro Street. Terence got a little to close to the centerline down track, and Litten just motored past him. (Terence 2 Close photo here). The Hawaya Pro Fuel, racers provided great wheels up performance from its entries, Michael Ray, Preston Bartlett, Jay Beasley and Tyler Wilson, who qualified exactly in that order. On race day, the team of Johnny Vickers tuning, with Michael Ray driving was the team to beat. LSR racing (the Long and Short of it Racing team – Preston being short, Walter being on the tall side) of Preston Bartlett driving, with Walter Halonski tuning did their best to do so. In the final round of Hawaya Pro Fuel racing, Preston’s 7.36 was close to Michael’s 7.35, but not quite close enough, with Michael Ray taking the win. 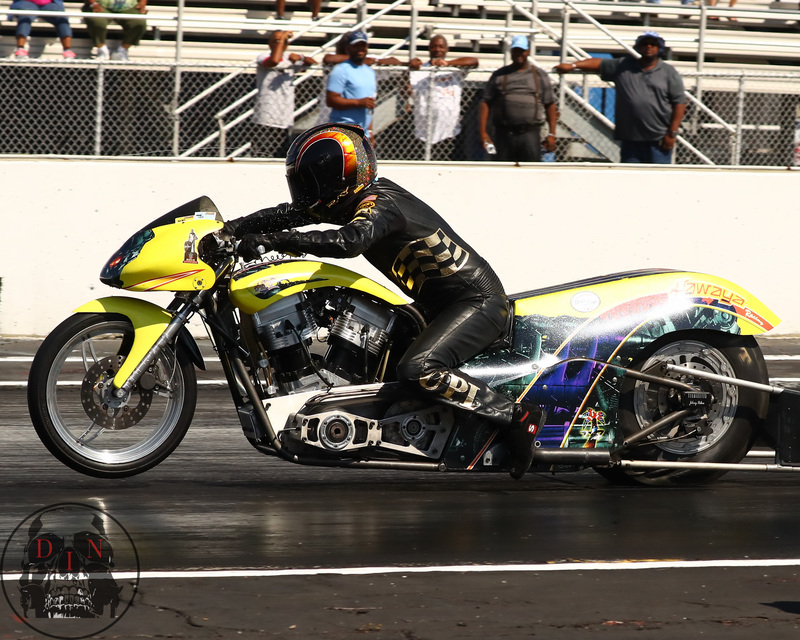 In the Shinko/WPS Real Street class, Dave “Super Dave” Stewart turned heads with a strong performance all weekend. His 7.669, elapsed time he recorded during Q-1, was good for the #1 qualifier spot, which also earned him a bye-run for E-1. 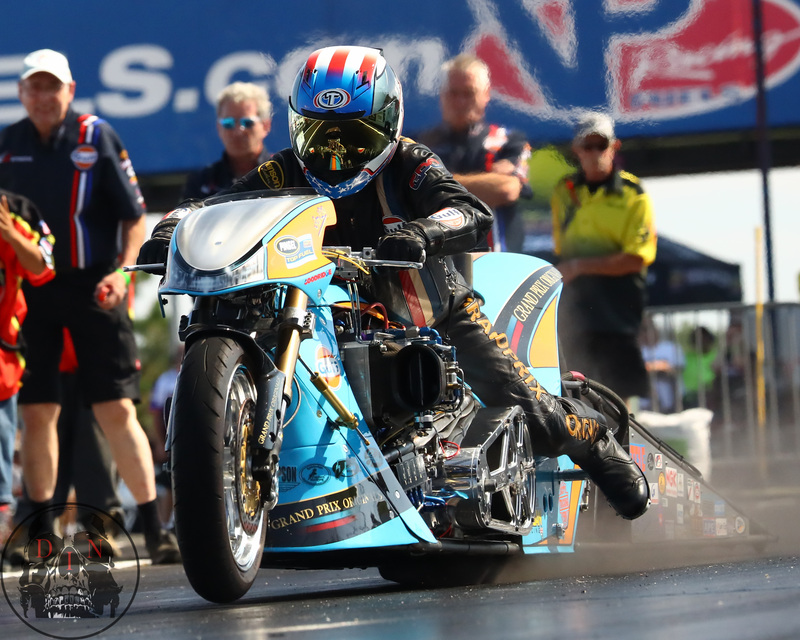 He saved the best for E-2 where he uncorked a world class 7.652 @190.89 MPH that had everyone shaking their heads. In the final round, Dave matched up with Johnny Dobrin and swept the event by taking out Johnny “Turbo” Dobrin, 7.74 to 7.79, for the win. 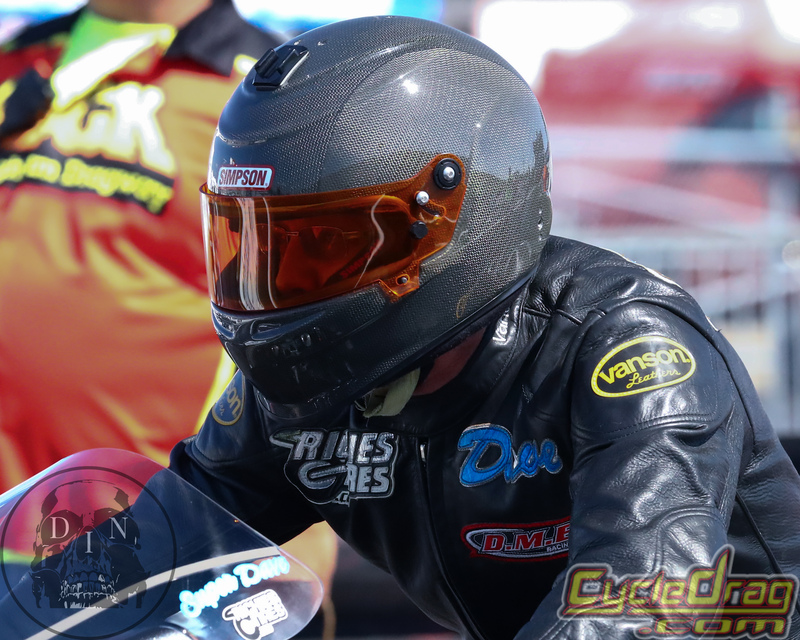 Sportsman racing at the DME Nationals event kicked off with C&S Custom Street ET, the Vance & Hines V-Twin series and MPS Pro ET class. On Saturday, MPS Pro ET was won by Stephen Knight with John Markham in the R/U spot. 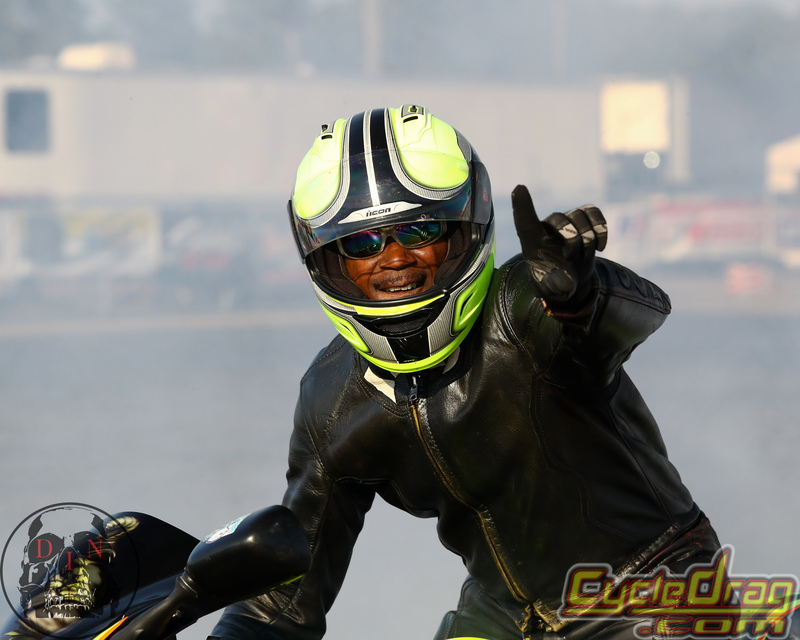 C&S Custom Street ET racing was won by Brian Dale over Spencer Claycomb and The Vance & Hines T-Twin race on Saturday was won by Barry Pryer Sr., over Manny Carrasquillo. 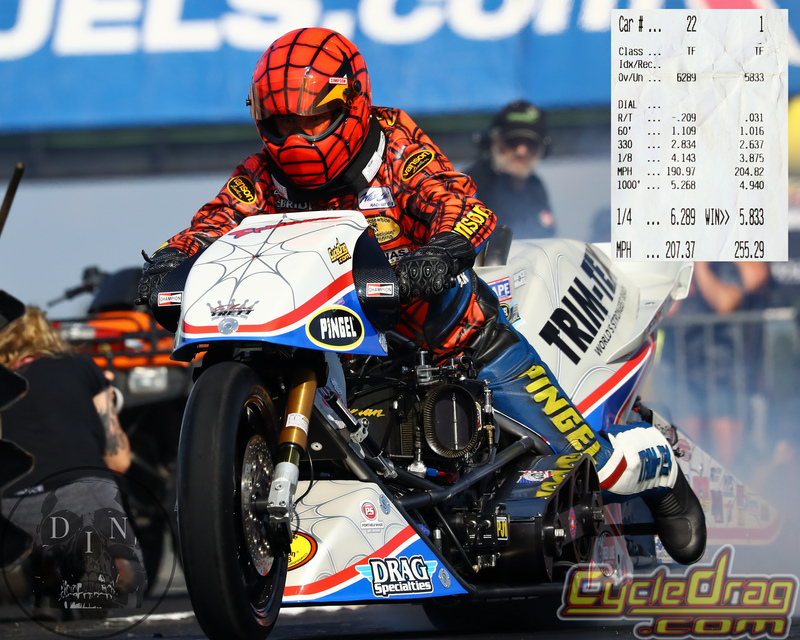 In Sportsman Index racing: the Grothus Dragbikes Ultra 4.60 class, the top-ten qualifiers were all running in the 4.6-Oh’s on the 4.60 index. 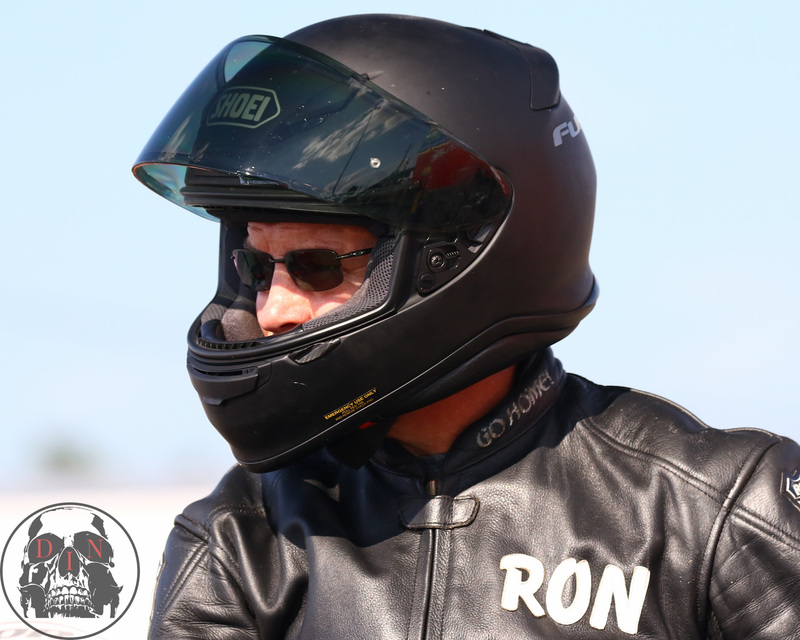 Ronnie Procopio’s 4.604, was the closest run to the number, good for the #1 qualifying spot. When competition ended on race day, the winner was Broderick Jackson with a 4.60, right on the number, over veteran racer Tony Mullen, who broke out trying to run Broderick down. Star Racing Top Gas racers, running on the traditional 8.20 Index, saw Alan Fields out front at the conclusion of qualifying, with his 8.208 as the closest run to the index. John “Spooky” Markham with an 8.22 ET was the next best. The #1 qualifying spot earned Alan a bye run in round one, then he took out Ben Knight in round two. In the final round, Alan matched up with Pete Chongris, who bested him as Alan encountered mechanical problems, ending his day of racing. The win went to Pete Chongris, who defeated George Jones, Dustin Lee, and Jeremy Teasley, along his way to victory lane. As for the Super Comp racers, going at it on the 8.90 Index, Jeremy Teasley’s 8.904 was but a tic better than Spooky’s 8.908, for the #1 qualifying spot. John “Spooky” Markham at Rockingham was one tough customer all weekend long. Teasley, who’s a highly skilled racer as well, just stormed through the field to meet up with Shawn Welch in the final round. In the last match up, it was all Teasley, going 8.961 on the 8.90 dial for the win. There was great side-by-side racing all weekend. 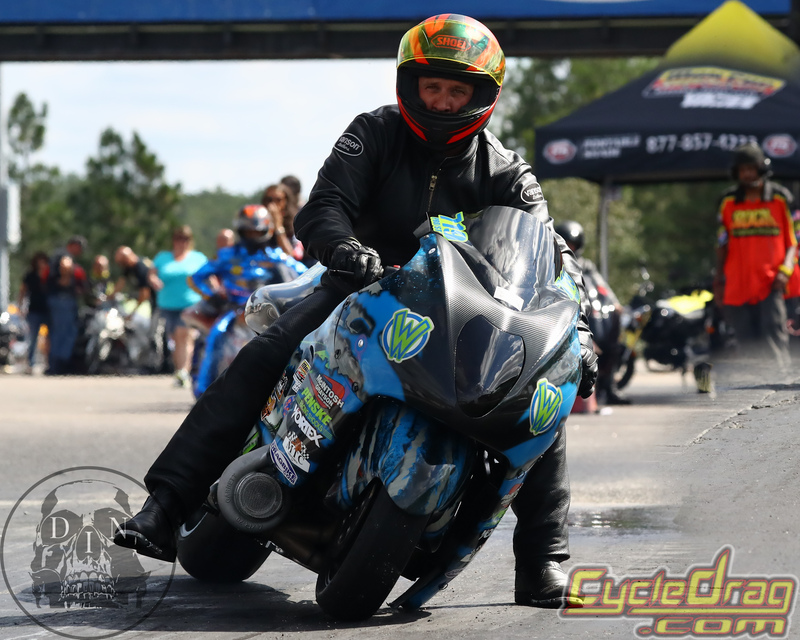 In World Wide Bearings Crazy 8’s racing, with racers working off the 8.88 index, qualifying on Saturday showed that veteran Ron Arnold’s 8.885 was best, just ahead of Dusty Brazel’s 8.889 effort. After qualifying #1, Ron got to work right away by eliminating Ben Knight in E-1, and Keith Brown in E-2. On to the finals, it was Ron Arnold Vs Dusty Brazel once again. Veteran Ron Arnold got the better of Dusty this day. Mr. Brazel has come oh-so-close more than once this season to the winner’s circle, but he’s still chasing that elusive win. 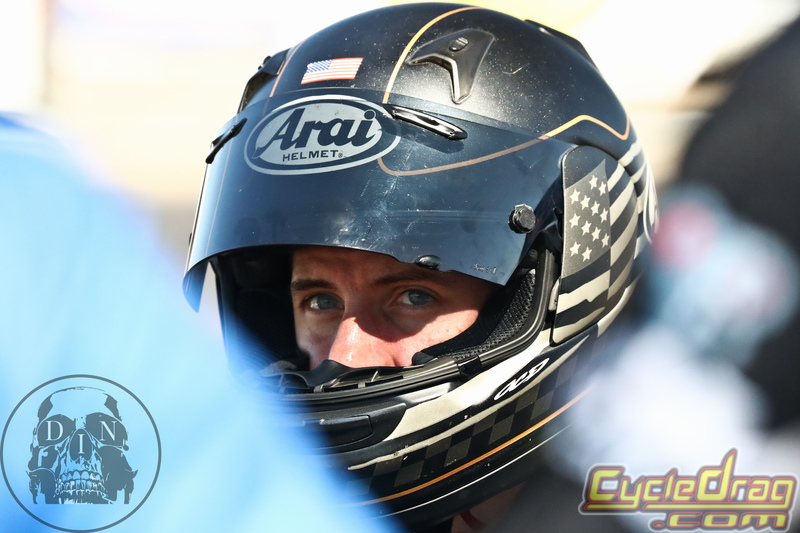 The Wiseco Street Fighter class, racing on the 9.50 index saw Chris Roelse take the top spot on Saturday during qualifying. Sunday on race day, it was Jason Herron in the winner’s circle after he defeated Pablo Gonzalez. Jason’s Real Street bike motor developed a problem, so he hopped on the spare bike, and brought home the win in Wiseco Street Fighter. Not bad on a bike that he had not run down the track before Saturday morning! 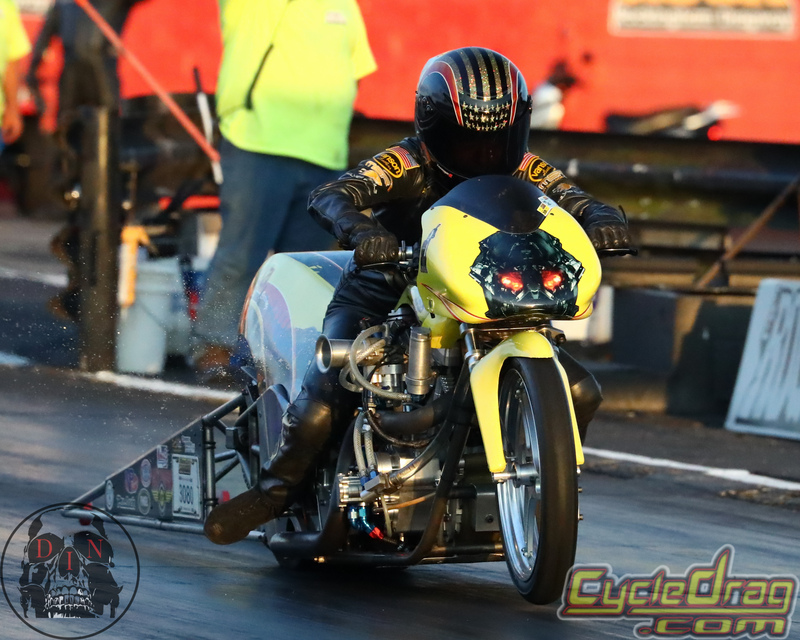 MPS Pro ET on Sunday, Ted Harvey defeated Eric Griffith by strapping a .009 light on him to start the race, then went 8.12 on a 811 dial, to wrap it up. 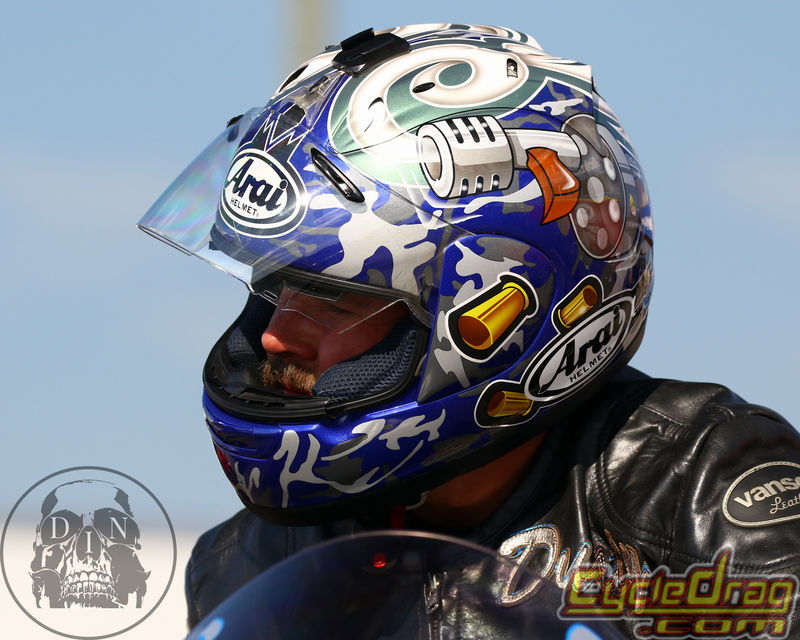 During C&S Customs Street Et action, John Fernandez was the top dog after he defeated the always tough Ron Arnold. John’s 8.364 on a 8.360 dial was just spot-on.